Some days, it seems like any number of topics might lead The Interface. Other days, nearly every major outlet in our orbit writes a version of the same story. Thursday was one of the latter: Facebook’s removal of probably-Russian disinformation has tripped up scores of real-life American activists, causing legitimate protests to be removed from the service, and we’re only beginning to consider the implications. The activists were caught up in Facebook’s announcement earlier this week that it had removed 32 pages, with more than 290,000 followers, after discovering that they were part of a secret campaign to influence American politics. Facebook reported at the time that these accounts were harder to find than the Russian agents of the 2016 election campaign. The people who created them took creative steps to make their accounts look authentic. It’s one reason why Facebook can’t say definitively that the current influence campaign is Russian in origin, though there are strong signals that it is. One way fake accounts can look authentic is by associating with real ones. According to activists in the above-linked stories, that’s just what happened here. 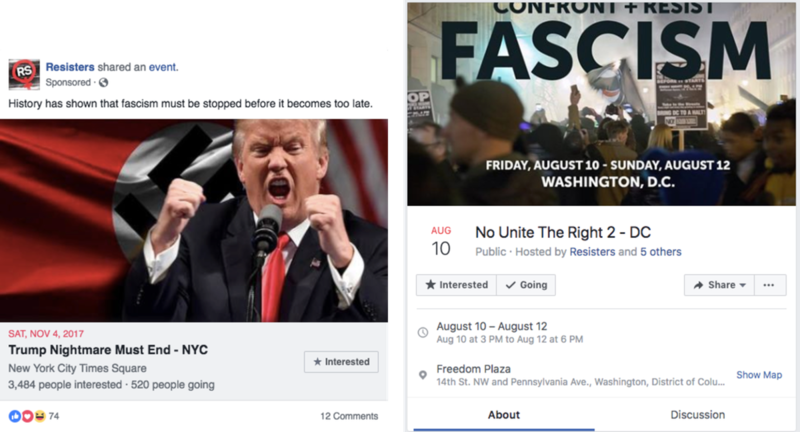 When Facebook discovered the subterfuge, it removed public events created by the fakers, even though thousands of Americans had registered to attend. “When we started organizing we talked about making a Facebook page and saw that this already existed,” Batcher said. “It happens pretty regularly in DC knowing how many major events take a place here. As a strategy for sowing chaos, fake events appear to be every bit the equal of fake news. As Sam Woolley, director of digital intelligence at the think tank Institute for the Future, asked the Journal: “What’s real grass-roots activity versus fake grass-roots activity?” he asked. A side effect of the disinformation campaigns is that they make social media as a whole seem inherently untrustworthy, and give fodder to those who want to cast doubt on the legitimacy of authentic movements. Already, some partisans have adopted the tactic of sowing doubt about internet-based movements by painting their opponents as Russian trolls or agents of a foreign-influence campaign. This type of suspicion appears likely to grow, as influence campaigns get harder and harder to distinguish from authentic activity. For activists, there are clear lessons to be learned: Be careful whose online protests you promote. Insist on a video chat with that new suspiciously eager protester who wants you to be an administer on their page. When they tell you they’re an American, ask to see the receipts. For Facebook, the evolution of events into a major new attack surface has generated another thicket of difficult choices. Remove events and their related posts too aggressively and you’re stifling the speech you have promised to protect; be too lax in your enforcement and invite regulation and the continued decline of democracy. And whichever way you lean on a given day, loud voices will be there to tell you that you’re doing it all completely wrong. Fake news can sow division and make you doubt the legitimacy of the articles you’re reading. Fake events go a step further, making you doubt the motives of everyone around you. They distract you from your objective and sap your energy. As a weapon of disinformation, they can be devilishly effective. I started writing a daily newsletter last year in part because I wanted to see how disinformation would evolve for this year’s midterm elections. The emergence of fake events as the new fake news represents a significant new mutation. And it’s not clear that any of us are prepared for what comes next. The GRU campaign appears to have had two main goals: to mobilize American opinions, especially African-American opinions, against Clinton, and to spread propaganda which served Russian military interests. It was much smaller and more focused than the Internet Research Agency operation. It seems to have worked much more closely with the hacking units, although its ability to amplify their leaks was limited. Above all, unlike the troll farm, it was conducted by serving officers in Russian military intelligence. Jack Dorsey sat down with Fox News Radio’s Guy Benson to address the ongoing, bad-faith allegations that Twitter is “shadow banning” conservatives. DORSEY: The net of this is we need to do a much better job at explaining how our algorithms work. Ideally opening them up so that people can actually see how they work. This is not easy for anyone to do. In fact there’s a whole field of research in AI called ‘explainability’ that is trying to understand how to make algorithms explain how they make decisions in this criteria. We are subscribed to that research. We’re making sure that we can help lead it and fund it, but we’re a far way off. So in the meantime we just need to make sure that we’re pushing ourselves to explain exactly how these things work. How we’re making decisions. Where we need to make decisions as humans vs where the algorithms make decisions based on behaviors and signals. The GOP House leader wants to hold yet another hearing over “allegations that the platform limits the reach of some conservative accounts.” At this point, it’s hard to call these hearings anything other than an intimidation campaign against the social networks. I can’t imagine anyone ever particularly enjoyed seeing tweets automatically posted to Twitter. “Wsers will instead have to copy a tweet’s URL if they want to share a tweet to Facebook going forward,” Sarah Perez reports. Don’t do this either! Speaking of automatic posting, you can no longer post your WordPress blogs to Facebook. If you were doing this and it was working for you, please DM me. Facebook announced $4.5 million new money for programs that support news publishers. Most of the money goes to teach local publishers how to build digital subscriptions businesses. They’ll take it! Due to an oversight, I forgot to include this important item from my colleague Shannon Liao in yesterday’s newsletter. Businesses can now pay to message users, opening up WhatsApp’s first real potential source of revenue — assuming anyone wants to interact with businesses in this way. Given the way that’s played out on Messenger, I’m skeptical. But I was also skeptical that WhatsApp’s brutalist take on Snapchat stories would succeed, and it’s now the most-used such format in the world. So I would believe anything about WhatsApp’s revenue opportunities, basically. Mobile game advertisers can now create ads that you can play without first installing the game. Useful! Part of me feels like I should have been prepared for the Comcast corporation (disclosure: an investor in Vox Media) to see the Time Well Spent movement as a content marketing opportunity, and create a web page promoting a “phone cleanse” that also serves as an advertisement for buying additional Comcast services. Also, it should be noted that there’s a hard copy book of the phone cleanse. I don’t know why. But it exists, and you can tweet Xfinity Mobile to get one shipped to you for free. The only cleanse I’ll be doing after reading this web page is a shower.